Now, as the person who cooks around here, I don't quite get the allure of assembling your own lunch. I assemble lunches of some sort 7 days/week. It's really not all that fun. 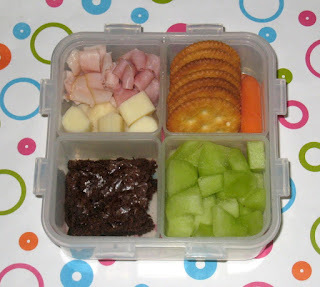 However, they think it's awesome, so lunchable-style bentos it is. For the meats, we have turkey and ham flowers (skewer with a bit of uncooked spaghetti instead of a toothpick) and for cheese, some chunks of mozzarella. There are some crackers and carrots, lots of honeydew, and a bit of brownie that I made the other day. And apparently, one of Faith's friends wants her lunches because they are cute. Cute is important to the 9 year old girl set. LOve the ideas u post . Hey where did you get the container ? It's a Lock & Lock container, I got it years ago at Target, but haven't seen them in awhile. I think you can buy them online still. You can get the Lock & Lock on Amazon, and I think at allthingsforsale.com as well.